Your conversion rate changes with weather? You sell more of a certain product when temperatures go up? Learn about weather-based audiences. 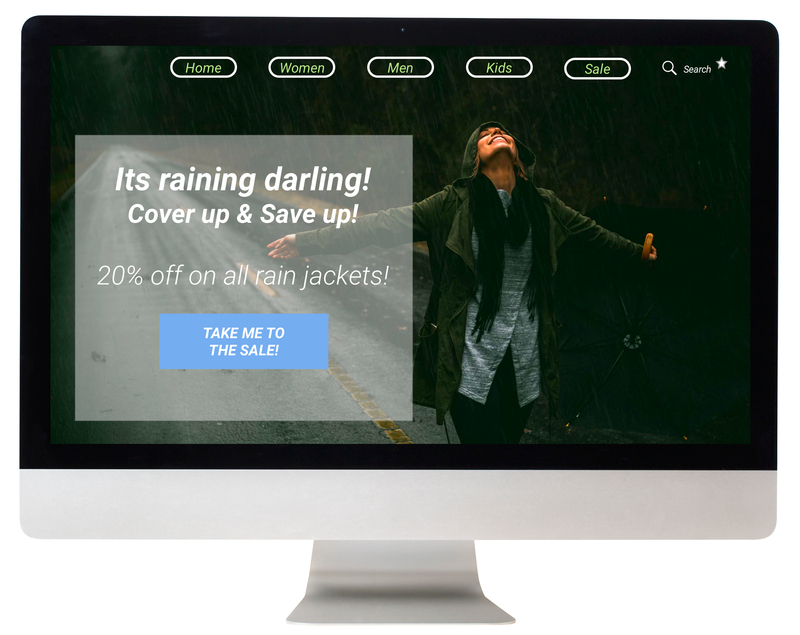 Create hyper-targeted experiences for your visitors and customers based on the local weather and the changing temperatures. Especially event, travel, catering, and fashion businesses can benefit from segmenting website visitors based on weather conditions. Weather-specific promotions: Some businesses are strongly influenced by customers' last-minute decisions. 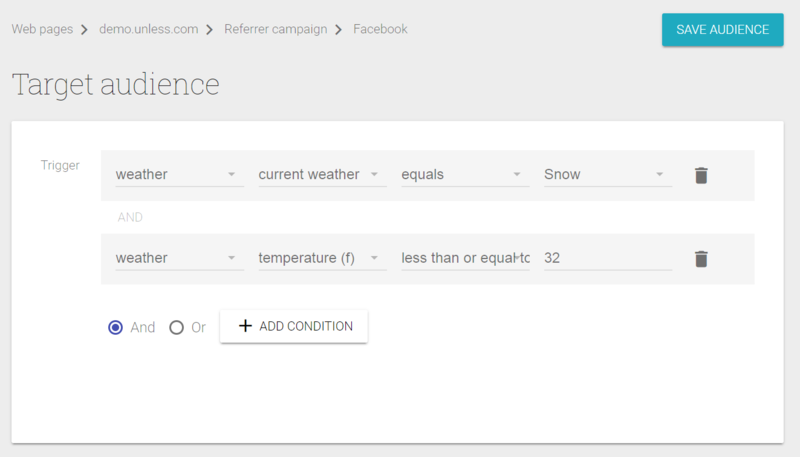 To use this to your advantage, add weather-tags to your products and dynamically populate your homepage. Do you run an event promotion platform? Push festivals on sunny days and indoor events on rainy ones. You can expect a conversion increase of 8-12% from this. Weather-based discounts: Many restaurants and bars offer weather-based discounts on their menu. Take it one step further and display special offers directly on the website. 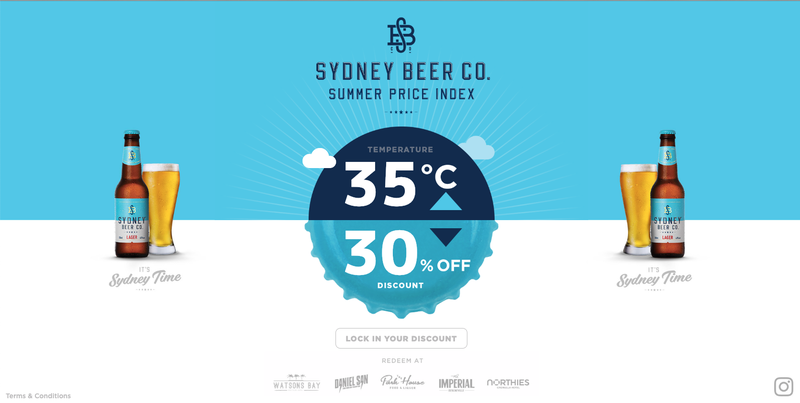 Below, an example of a brewery in Sydney that ran a very successful "summer price index" campaign that also received a lot of media attention. Increase impulse buying: In fashion, impulse buying accounts for 40% of all purchasing decisions. Needless to say, weather-based discounts can strongly influence this number. Is it rainy in the UK? Show a 20% discount on your rain jackets for British customers. Most likely you'll not just see more raincoat sales but an overall increase in purchase value. Current Weather: For this, we use a weather API that provides us with information about the current weather conditions based on a user's location. The API accesses weather data for over 200,000 cities and is frequently updated based on global models and data from more than 40,000 weather station. Using it, you can choose from a range of weather conditions - from clear day (= sunny) to snow. Temperature: Type in the temperature (in Fahrenheit) to create an audience around hot/mild/cold weather. With the above conditions we will target regions where it is currently snowing and it is cold enough for the snow to settle.